Syneron’s eMatrix system draws on aspects of the company’s industry-leading Electro-optical Synergy technology to create a powerhouse in the field of sublative skin rejuvenation. eMatrix is less harsh than laser therapy, yet has proven more effective than competing methods of fractional skin resurfacing. Rather than light, Syneron’s eMatrix relies upon fractionated bipolar radio frequency. Radio frequency can deliver heat deep into the dermis without significantly disturbing the epidermis. Heat incites a healing response; unperturbed healthy cells work synergistically with the healing response generated by the damaged cells to accelerate the production of new collagen and fresh, healthy skin. 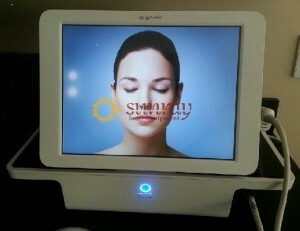 Treatment with Syneron’s eMatrix is appropriate for all skin types and causes no post-inflammatory hyperpigmentation. Both physicians and spa technicians appreciate the rapidity of eMatrix treatments, which can often be finished within 20 minutes. The unique SelectPulse feature enables the therapist to customize the treatment for specific conditions. Syneron devices are some of the most popular products that SunrayLaser.com carries. As a result, our laser refurbishing team has developed a thorough understanding of Syneron equipment. We guarantee that each previously owned eMatrix device will both perform to the expectations set by the manufacturer of the original equipment and exceed all applicable international safety requirements. At SunrayLaser, a senior device technician is always available to discuss the ways a Syneron eMatrix can add to the lineup of therapies your practice can offer. Please get in touch with us via the form below and a knowledgeable Syneron specialist will be in touch soon. The Syneron equipment in our current inventory was treated with care by its previous owner-operators and has a low pulse count. We don’t expect this eMatrix to remain in stock very long, so please ask today for your free price quote!